Soldier killed after driving against traffic, colliding with truck. 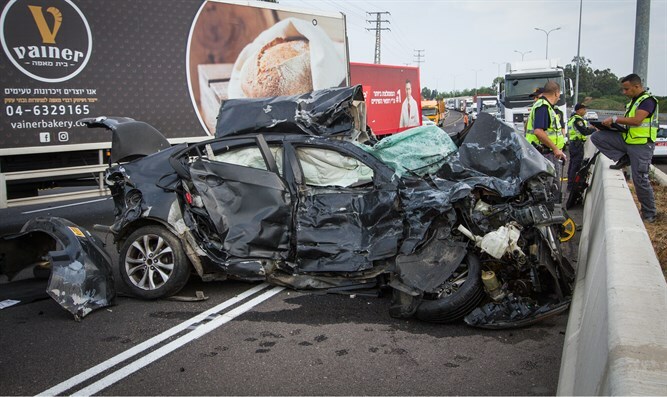 The Israeli man who was killed in a car accident Monday morning was identified as an IDF soldier from the coastal city of Netanya. Shahar Rubler, 19, was killed after he struck a truck on Highway 2, near the Havatzelet interchange, south of Netanya. An initial investigation into the incident revealed that the driver of the vehicle, later identified as Rubler, had jumped a curb, hit five other vehicles, ran a red light, and drove against traffic. Police officers who noticed the erratic driving told him to stop. When they approached him, he continued driving, jumping the curb, and continued driving on Route 2 on the wrong side of the road. He continued and struck other vehicles until he struck a truck. Paramedics declared Rubler dead at the scene. Two others where were slightly wounded and were evacuated to Hillel Yaffe Hospital in Hadera. Highway 2 was closed for several hours on the southern bound lanes near Netanya and was reopened after the road was cleared. Senior Magen David Adom (MDA) paramedic Reuven Ivgy and MDA paramedic Eyal Drori said: “When we arrived at the site, the situation was extremely serious. We saw a car crushed next to the guardrail and a heavily-dented truck next to it. In addition to five damaged vehicles, a 19-year old was found unconscious, not breathing, without a pulse, and with severe injuries. After we pulled him from the vehicle, we performed a vitals check. He did not have any vital signs and we had to declare him dead. Two other men from the truck who were injured received medical treatment and were evacuated to the hospital. They are in stable condition."